The winning design for the Perth Stadium has been revealed with a contract between the Western Australia State Government and Westadium, a consortium led by Brookfield Financial and John Laing, to be signed in the coming days. 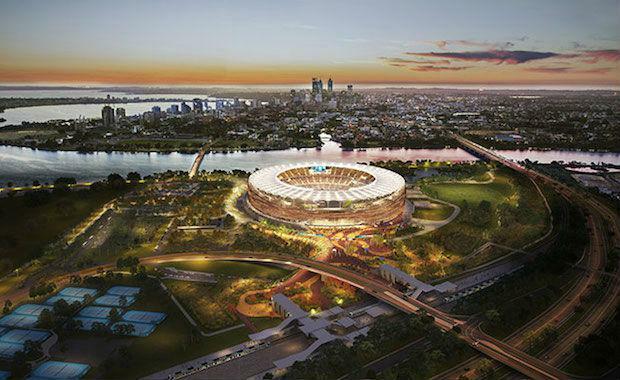 Contractual negotiations included the design, build, partial finance and maintenance of the new Perth Stadium and Sports Precinct, which were successfully concluded, allowing the design details to be unveiled. “The winning design successfully meets the State’s requirement for a world-class, multi-purpose stadium within a parkland setting, and does so with a uniquely Western Australian focus,” said Western Australia Premier Colin Barnett. The bronze façade uses anodised aluminium which reflects WA’s unique geology by day and using state of the art LED lighting, home team colours by night. Recreation Minister Terry Waldron revealed some of the more specific details of the stadium were the generous seat sizes and access to more than 70 food and beverage outlets. Technology provisions include 4G Wi-Fi coverage across the stadium and precinct, two giant 240 square metre video screens, some of the biggest in the country. The design of the sporting and recreation precinct surrounding the stadium is inspired by Dreamtime stories and the connection with the Swan River. The precinct will include an amphitheater, two children’s playgrounds, and a network of walking and cycle tracks throughout. The new Perth Stadium is due to open in the start of 2018.